I wrote this paragraph at 9:30 pm. Long after I wrote everything else below. Right after Gabby earned her wings I told another parent who has a child dealing with Cancer: People will forget Gabby. She agreed. Not in a bad way, She was just stating a fact. People move on. They move on to support the next child, they move on in life. After I wrote the rest of this Blog I told Carolynn it wasn’t good. There wasn’t anything that would help people in this one. I write this Blog at times to make sure people still listen, haven’t forgotten her. It’s obvious how many more people go to her website after I write these. But today I wrote and realized it’s the same thing. Nothing new, nothing different just the same story, tears, fears and doubt. Carolynn made me realize something. I’m Stuck. I used to say I was lost and broken. I see now I’m just stuck in the same place and can’t find my way out. I’ve cut off friends and family. I don’t feel love, anger, happiness or even sadness right now. Don’t get me wrong I’m devastated and miss Gabby and the way my other daughters were so much. It’s just right now all I seem to want to do is sit, watch birds, stay up till I pass out and then sleep. I wake up and go through the motions, help the girls with homework, play games and read with them but like I said before: I just wake up and count the minutes till it’s quiet again and I don’t feel guilty for just wanting to sit in a spot and not talk. I just want to go back to sleep. So listen when I say this. Don’t just hold your child tighter because of what you have read here for the next few months. Truly change your way of thinking, change how you live. Truly appreciate your life and enjoy every minute of it with the ones you love. Because if you don’t one day you may wake up and realize you’re stuck to. To all the new supporters I wanted to say thank you and welcome to our journey. For all the existing supporters that have stuck with us thank you. For anyone new I wanted to explain a little about this blog and the rest of the blogs on Gabby’s website. I write for a number of reasons, to make sure the world knows what Gabby went through, to get these thoughts out of my head, to make sure that others going through this understand they are not alone, and there could be people thinking the same things. I say some rough things, things you may disagree with. In the beginning of Gabby’s journey I at times went too far. I said some pretty rough things. I won’t delete them. It was how I felt at the time. I have been open and honest and won’t change that now or ever. When Gabby earned her wings I drank a lot right after. I no longer drink to dull the pain, I write, I read, and I try to keep moving and be there for my family. Some days I do better than others. Yesterday wasn’t one of those good days. Gabby was granted a wish by Make a Wish to go to Disney. When the organization came out they like to have the child tell them what they want. Gabby at this time was frightened of everyone and could barley talk, but she did manage to say so very quiet “ I want to see the princesses”. We decided to wait until her treatment was over and Gabby was feeling better to use her wish. Gabby earned her wings a few weeks after her treatment ended. She never got better and never got to see those princesses. 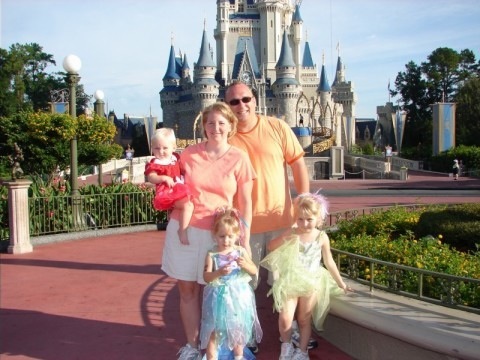 The last and only time Gabby saw Disney was over her first birthday, six years ago. When Gabby earned her wings the trip was no longer available to us since it was her wish. I didn’t want to see Disney ever again at the time, and still don’t want to see it for a very long time. Gabby’s two older sisters who knew we were supposed to go to Disney asked if they were still going. How were we supposed to tell them that not only did they lose their sister but this special vacation for them was gone to. After posting this information on Gabby’s facebook page, a supporter of Gabby’s started a campaign to earn money to send us. The organization Wish Upon A Hero also started to raise donations to send us on this trip. It was amazing to see so many strangers who we have come to love and talk to on a daily and weekly basis care so much to make Gabby’s sisters dream now come true. With all the donations we received Carolynn and I decided we needed to go for the girls. We didn’t tell them we were going. We let them believe we had a bowling fundraiser to go to over the weekend and they were coming. They were not very excited to go bowling but they knew they were doing it for their sister. While they were at school we packed all our suitcases. We didn’t want them to see the swimsuits and sandals. We had planned to stay at a hotel near the airport. We told them we had to park in a special lot and take a shuttle to the hotel. We also told them we had to walk through the airport to get into the hotel. We are tricky parents. When we arrived inside the airport, we stopped to look around for what direction we had to go to get to the hotel. The girls sat down and we asked if they really wanted to stick around Philadelphia that weekend. I said it’s too cold here, lets go somewhere warm. We asked them, if we could go somewhere, where would you want to go? Madison said very quietly “Disney?” I asked them if that’s where they wanted to go, Disney? So John and I said, sure, let’s go. The conversation continued back and forth until they finally realized there was no bowling fundraiser and we had planned this all along. The girls were confused and in shock, didn’t understand what was happening but eventually they got it and were overjoyed. 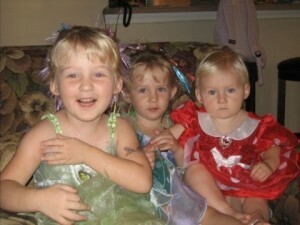 As we flew to Florida I started looking at pictures of Gabby and her sisters. I looked next to me and Maddie was pressed up against my arm. Katie was sitting with Carolynn. Katie doesn’t eat a lot anymore, always says she feels sick and is constantly worried about getting a fever and throwing up. I broke down bad, couldn’t control it. All I kept thinking is there is an empty seat. 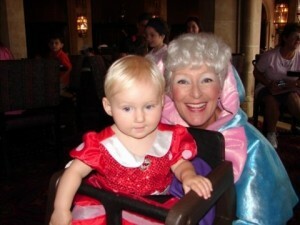 The last time we flew to Disney Carolynn held Gabby the whole way. This time all we held was magazines. Carolynn came over and put her hand and my shoulder. After I stopped, Carolynn started crying. Disney was tough; On October 9th 2006 we had breakfast with the princess’s in Cinderella’s castle. Six years later we took two not three sisters to the Bibbity Bobbity Boutique and then lunch with the princesses. I would love to say it was a good time, but I can’t. It was just so unnatural. The girls were all dressed up but you could see it in their eyes a longing for Gabby to be with them. I look at the pictures of Katie sitting in the salon chair and I can see a beautiful little girl hurting so badly. When we went last time we must have rode it’s a small world 10 to 15 times. In the video Six Candles and No Cake, you can see Gabby sitting on my lap as we start the ride. I cried the whole time through the ride this time. We only rode it twice. Each time it hurt. Winnie the Pooh, Peter Pan all of these rides hurt. Looking at the Mickey hats, swimming in the pool, all if it tougher and harder than the last ride. Carolynn and I tried to smile and not be sad. Sometimes we managed, other times not so much. About half way through we stopped crying and just felt numb. We all started to collect pins trying to keep our mind off of what was missing. While we were there, we kept Gabby with us by collecting pins and getting an autograph book signed for her. While we were at Hollywood Studios I told Carolynn I wanted to buy something for a little girl. I was having a hard time deciding what to purchase when two children and parents ended up behind us in line. I told the casher we would buy what they had for them. One little girl had a cat stuffed animal and the other little boy had a stuffed animal pig. Their parents were shocked and very thankful, the cashier started to cry a little bit as well. We told them it was from Gabby and spread Gabby’s story a little further that day. Gabby loved what she called” squishy princesses” basically little toys that came with little rubber dresses. I had bought one that was Minnie Mouse and was going to give it away. Carolynn told me to wait until later. As we were walking through the park Carolynn told me to give it to this one little girl she saw dancing. I asked the mother if I could give her the gift. Carolynn talked to the women and told her about Gabby and why we wanted to give her daughter this gift. It turns out the little girl was five years old, she has Down Syndrome, and her name was also Gabby. Wow! While Carolynn was talking to this mother Gabby was looking at Katie’s Disney pins hanging around her neck. Katie took off her lanyard and put it on the little girl. She also told her she could pick any pin. Katie had been collecting one specific collection so I was shocked to see that she let the little girl take one of the pins from this collection she was trying to complete. I told Kate I was very proud of her. She looked at me and said, “Dad there are worse things in life than not having all the pins.” Amazing the wisdom that our eight year old has. We had been collecting a collection of pins for Gabby. It was a heart pin with a princess holding a butterfly on it. We had found all of the pins except Ariel. We looked everywhere for this pin to complete her set. The last day we were at Hollywood Studios and we were talking to a cast member. She sent out an email to all of the cast members in the park. We were told to check back with them before we left the park that day. We did as we were told, but they didn’t have any luck finding this pin. 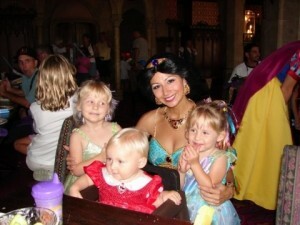 We went to Downtown Disney that night as well and kept searching through cast members. I left my email address with a cast member who said she would do everything in her power to get us this pin. The next day as we headed for home, I got an email from the Disney cast member who stated that Mickey had made some magic and they found the pin. They were going to be sending it to us at home. Now Gabby’s set would be complete. I also was collecting a certain type of pin and completed a set. The last night we were there I noticed a young boy and his father looking at my pins. He explained that he was collecting the same set and couldn’t find one I had. I took the pin off my lanyard, breaking the completed set and handed it to him along with a Gabby bracelet. To me it was a pin; to this kid it was a battle, a trophy, and a complete set that hopefully he will remember for a long time. Like Katie said there are worse things in life than not having a pin. The girls wanted everything! It didn’t matter what it was. In my mind I think they kept thinking that the next toy would ease the pain and make them feel better. I have a suitcase full of souvenirs that still has not been completely unpacked. It was hard to say no. They have had such a hard time lately and all we want to do is make them smile. But getting that smile from buying a stuffed animal isn’t going to keep it there long. Lots of people have given us the same piece of advice. Find something new to do. Something you’ve never done before. There is a problem with that. Every new thing we do is a reminder of something Gabby will never get to do. We rode in a convertible while we were down there. It hit me that she never rode in a convertible and will never get to. I started thinking of all the firsts that Gabby will never have. Gabby never lost a tooth, will never know the joy of putting the tooth under her pillow and waking up to find a surprise from the Tooth Fairy. She will never get her ears pierced, never know what it’s like to go upside down on a roller coaster like her sisters did for the first time at Disney. Someone posted I should start writing about all the good times we had with Gabby. They are so hard to remember. But I can remember every location where she threw up at the old house, every scream when they accessed her port, the look in her eyes when she tried to drink or eat something and couldn’t swallow it. Even the good stories slip into a bad one. 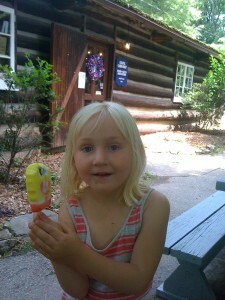 I took Gabby to Valley Forge Park one time, just her and me. 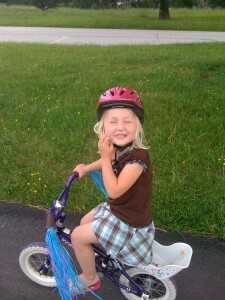 I took her bike with training wheels so she could ride it. 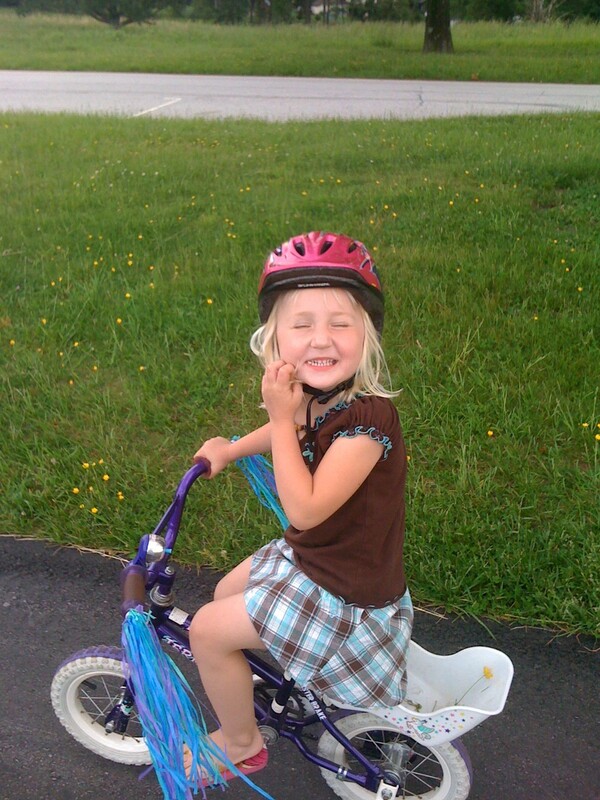 She loved riding her bike and couldn’t wait to get the training wheels off. (Something that she’ll never experience now.) We ate lunch in the back of my truck, she loved that truck, afterwards I took her to the Cabin gift shop and we ate ice cream. I miss the sound of her laugh and her smile as she ate her SpongeBob ice cream with gumball eyes. She loved gum! It was a great day! I loved sleigh riding in Valley Forge with her sisters, watching her scream as she flew down the hill. As great as those memories are I’m stuck on one. Right before she was diagnosed I took the three girls and their cousins on a hike through Valley Forge. We hiked up a huge hill. Gabby was having trouble going up the wooden steps. I kept telling her to come on. Finally I gave up and told everyone we were going back down the hill. Gabby was having trouble with that. Finally I picked her up threw her on my shoulder and ran down the hill. I remember being angry with her. Looking back at it I know now she must have been sick at the time. She had trouble with her balance. I won’t ever go back there. Last night I again realized she is never coming back, no matter how much I wish and pray, she’s not here. People tell me to write good stuff, happy heartwarming things. One-day maybe, but not today. I preach to all of you about loving your children and friends, about having patience with them. Playing with them when they ask. But I sometimes forget. I don’t sleep anymore. The nightmares are too bad. I’m always so tired that sometimes I say no. I get angry with the girls. They say they are bored and want to play. Yesterday I just couldn’t do it. I thought in my head, they are bored? I just wanted to yell at least you’re all alive! Of course I didn’t, I never would. I counted to ten went outside and came back in and smiled, and asked Maddie what she wanted to play. I love all my daughters and would never do anything to hurt them or say the things that float through my head. I realized grief and I have to deal with it. For the rest of my families’ life we all will think these things at times. How we deal with those thoughts is what counts. 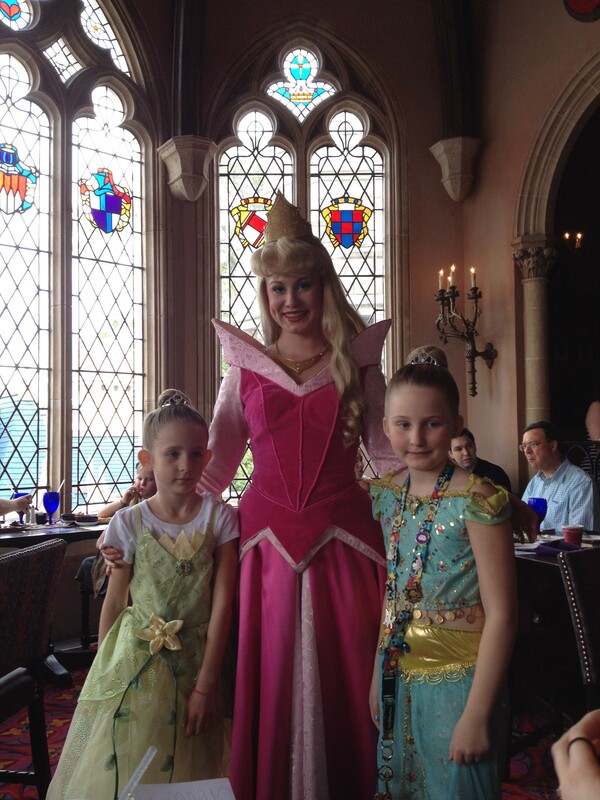 We did teach the girls a curse word in Disney. Even told them they could say it when they are with us. We told them it’s okay to call Cancer a Jackass! We met with our attorney, are filing the final paperwork, need to make changes to the website. Have constant discussions of how we do this, how we make a difference. What type of fundraisers we want to do. I’m excited and scared at the same time. Get Well Gabby needs to change the world and we need to make that possible. For not just my Gabby but for all the children out there fighting for all those parents and family members, for everyone to make sure their children get to experience tooth fairies, upside down rides and school buses. We need to make sure that they only have good firsts and a parent doesn’t have to deal with accepting their child will never have a first of anything. Cancer is a Jackass and this month Get Well Gabby starts the real battle. Be part of it! For your children as well as the ones they will have one day. Help make sure you or no one you know will ever have to say they are in the ONCO family club. It’s a place no one wants to be. I read every post and every blog you write about Gabby. There are not words to express how sorry I am that your family is having to go through this hell! I have 5 kids and I know that if one of them were gone it would be horrific! I pray for your family daily! I pray that Jesus will wrap you guys in his arms and carry you through. I can’t imagine getting through something like this without a relationship with Jesus! He will walk beside you and when you feel you can’t go on one more moment he will carry you through until you are able to stand again. This post made me weep! The things you did for others while at Disney were so amazing! Your little girls are obviously wonderful, giving, loving little girls! You should be so proud of how you have raised them! I pray Jesus gives them peace and comfort while they go through their lives without their precious little sister! I pray that, in time, the memories will bring joy and smiles instead of tears and pain. I will not ever forget Gabby…thank you for sharing her with us! She reminds me of sweet little Delaney Wadsworth who was the first precious little one I had ever heard of with DIPG. Gabby’s picture is on my refrigerator so I will never forget to pray for your family! God bless your family! Lots of love and prayers to you all! I imagine you’re already aware of this, but just in case, I wanted to make you aware of Peter’s Place (www.petersplace.org I think) in Radnor. It is a center for grieving children, with support groups for all ages, etc. I wish it was available when my brother died (accident, not illness), and hope your surviving daughters can benefit from their services. Note: it is a non profit, so you do not have to worry about the cost. Best wishes to you. I enjoyed your latest blog entry. Cried as always when I read them. You are not only helping yourself heal through your blog, but also all of your followers that love & support your family. Always believing & never forgetting in Gabby! I have to say I often think of your Gabby. My family and I were in Disney the same week you and your girls were, and when we were in hollywood studios I saw all of you in passing. I wanted to stop you and say hello, and tell you I have been following Gabby’s story. But I just could not bring myself to do it. I figured you were in Disney to celebrate Gabby. And I did not know how to approach you guys. My heart breaks for you all and not a day goes by that i do not think of your preciouse Gabby! 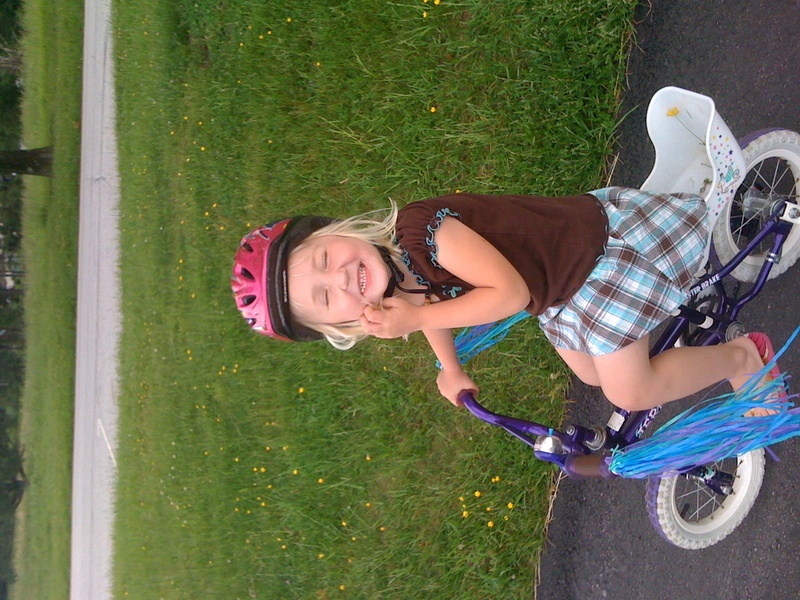 She was a beautiful little girl who reminds me soooooo much of my little Lauren! But as I sat here and read your blog tonight, I thought to myself wow I really need to start enjoying my two little girls. I am going to make a point to remember your blog when times are chaotic and i feel frustrated and angry that my girls are fighting, or maybe not listening! I thank god every day for my beautiful, healthy little girls. And I know that life flies by! So thank you for making me realize how lucky I am to have my family! As I read your entry this evening tears ran down my cheek. Not just for the loss that you and your family have had but for all of the families going through the same thing, in particular my daughter and her husband and their daughter. On September 7, 2011 they lost Jackson (nearly age 5) to DIPG. He to only survived a few months after diagnosis. I cry because what you say must be how my daughter feels…I don’t know what to say to her, nothing can make this feeling go away. I read some where recently that the feelings you have when you lose your child is like that of an amputated limb, some days the pain is so intense it is like the limb is still there…memories are a powerful thing, keep making them with your girls, Gabby will always be with you as Jackson will always be with our family. Like your family my Abby and her family needed to get away and here they are at my house ( I live in FL they live in MI) and we will be going to Disney on Wednesday. It is going to be a hard day, not only is it the day after the 5 month anniversary of Jack’s passing but Disney is what Jackson loved…unlike Gabby he did go on his Make A Wish trip to Disney and he also came again just weeks before he passed (he wanted to have his 5th birthday in FL-they did have a celebration for him). I know it will be hard for his parents and for his sister Allie (she is 7). I like many others have “moved on” with life…don’t get me wrong Jackson is never out of my thoughts and there are many days I feel guilty for going on with my life when he will not be going on with his but I know he is guilding me and smiling down on my life. I am sure that Jackson greeted Gabby when she earned her wings only days after he did, I know that together they make the sunshine brighter for us all. God Bless you and your family. I just wanted to tell the Vogel family that my heart is with you guys every day and I will do whatever I can to spread the word about Gabby. I haven’t lost a child to cancer, so I can only imagine the ups and downs your beautiful family goes through. I do know what it’s like to lose family to cancer and I want to include Gabby and other children with cancer in my fight for a cure. 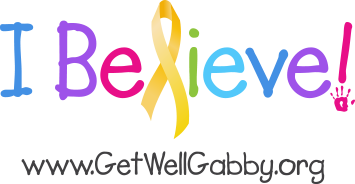 If I can do a fundraiser or be part of a fundraiser for the Get Well Gabby foundation, please let me know. I’m in Utah so trying to get to events in your area isn’t feasible for me, but I will do whatever I can here in Utah. The blog I have put as my website is my own personal cancer project, and I hope one day my project can do something great for Gabby. Thank you Gabby and the Vogel family for making me believe! Nothing but love for you guys as always! I saw a photo of a church sign that read, ‘Every Day Above Ground Is A Good One.” I thought of you immediately. I laughed, because most of the time it seems true. Gabby doesn’t miss the joys that she never experienced. Gabby’s body died. She doesn’t need new teeth. I think I am thankful Gabby’s battle was nearly over before anyone knew it was there to be fought. It must’ve been the longest months unimaginable with barely any time to even breathe.. The joys she had experienced trumped the hurting times. I don’t know what to say. I, too, am talking out loud, onto this keyboard… Gabby’s Spirit lives, but you are grieving. She doesn’t need a seat like we do. I would feel like I died through her, but, that isn’t right. It is the other way around~She lives in you. Living doesn’t mean she is forgotten. Live, and you might feel her in the joy. Because that is where Gabby is. A smile… A dance… Some weird-looking pink thing that she would’ve just LOVED!.. Let your daughters see that it’s OK to be alive again. I am sure she did not want you to die. Maybe I am not making any sense? Yell at me if you need to, but, please, Breathe again. As long as you write, we will ALL listen. Doesn’t matter if you repeat yourself. Doesn’t matter what the point of your blogs are. WE HEAR YOU. Let us all be your sounding board. Whenever. Wherever. Whatever. Say it over and over and over again, until it hurts a little bit less. No matter how many times it takes. WE ARE LISTENING!!! And even when you can’t make a sound, know that we still hear you both. PS~ Don’t you dare ever apologize for feeling, no matter what the emotion may be. It is your God given right. @Robin Baglivio-Grover, I hate to even give you the time of day, and especially on this page because you do not deserve it. But I am going to say to you what John & Carolynn are too decent and caring to ever utter. Grow up. Coming from someone who’s suffered thru the loss of a child, you’d think you’d have a bit (just a tiny bit) of tact within yourself than to come to a place that is sacred to this family, and smear it with your own self-loathing. I suppose not. Believe me, I’d love to say a lot more to you, but as I’ve stated, this web page is consecrated ground to the Vogels. I wouldn’t dream of smudging Gabriella’s beautiful soul with all that is dark within you. Besides, I have a feeling that you already know it’s there. I wish you Godspeed in getting beyond your own dark place. May you one day come to terms with what you wish you can be, yourself. Right now I’m filled with so many Emotions, My Heart Literally aches for you and Your Family… I know what You mean when You say Your Memories are focused on the sadness… I’ve lost Many Family members, ( a Niece that was 5 was the hardest) and it seems even when I Dream it’s sadness and darkness… I Think You and Carolyn are doing a Bang Up Job taking care of your 2 Sweet Girls after everything You have been thru…. I will continue to Pray for all of You!! I have fallen in Love with You and Your Family, You all are an Inspiration, Gabby would be proud!!!! BELIEVE!! I look forward to reading your blogs about Gabby and your dear family. I knew Disney would be so hard and there would be so many mixed emotions. So glad you found the pin to complete gabbys collection. So glad you bought things for others and shared gabbys story. I am am amazed at how many people I know that know of gabby because of the hard work you and carolynn do. Please keep writing and sharing. Before long 30,000 will grows to 100,00 and everyone will hear about gabby. Again thanks for sharing good or bad it’s the truth and everyone wants to read how cancer is such a jackass!!! Hi, I’m the mom of the little girl you gave the stuffed cat to. I had been unsure of whether or not to contact you until I saw this blog post. I wanted to let you know that you and your family touched our hearts and thoughts of you have stuck with us since that day. At night at our resort I would read your blog and cry. Avery (my daughter) loves her “Marie Darling” (her cat), she sleeps with it most nights. When we talk about our disney trip the moment we met your family and how you bought Avery her cat Marie is one of those special moments we always share. I’m so sorry for your loss, I can’t imagine what you and your family have and are going through. You truly have changed the kind of mother I am and want to be. I think of the times I told my son that I’m busy and can’t play with him and it breaks my heart. Why would I do that to him?? There will be a day when he doesn’t want to play with me anymore, I should love every second of it now!! That being said, it’s time to get off of this computer and give my son a big ol’ bear hug. I think about you and Gabby and Carolyn and your girls a lot. I canNOT imagine the pain. Just thinking about it brings me to tears. One day it won’t consume you. One day. Believe. Please don’t mistake quietness for “forgetting”. I ,for one, may not post every day, but I think you know that I will NEVER forget Gabby. I miss you both and the girls. Not a day goes by that I don’t think about Gabs. We all grieve in our own way. Just like always… I’m here if you need me. John and Carolynn, thank you again for sharing your family with us. I have been following Gabby’s FB page from the beginning and I will NEVER forget her. I have a Gabriella (Ella) who is just a month younger than your Gabby and I literally think about your family every single day when interacting with my Ella as well as my older daughter. I have grieved for your daughter like I knew her yet sadly I never had the opportunity. I am trying to change my outlook in so many ways, not just with my children but with all of the stressors in my life, I just remember what you all have been through and that my little problems aren’t so bad. I am sorry that not everyone supports your feelings but 99.9% of the FB followers do support your feelings and are glad you continue to share. Regarding your feeling stuck, how could you not be? The trauma you have endured will likely keep a grip on you for a long time to come. I think you are doing a great job of being there for your other daughters to show them that they have to keep living. You can’t just walk through life with a smile on your face pretending that the past didn’t happen, the past is what makes all of us who we are. If someday you want to reclaim some semblance of a happy life then you have to allow yourself to feel your feelings. I have been inspired by you so many times, most certainly the day after Gabby earned her wings when you talked about taking your other girls out for something to do. Please don’t be hard on yourself, I think that Gabby is smiling down on you, so proud of how you are sharing her message of love and hope. I will continue to pray for you and your family and hope to meet you during the walk in May. God Bless! The Vogels,You guys continue to irpemss me with your courage,honestly,and love for your family. I have been following Gabbys story since the very beginning. She has definately changed my life and the lives of so many others. I have gotten so many to go to her page and click like because I want to share with them as well. Both my parents and grandparents have had Cancer and I lost my little boy age 2 in 2004. My life has been the roller coaster you described so well. I know Gabbys foundation will grow in leaps and bounds. I want to stop cancer in its tracks. It is horrible and takes so many lives and so many innocent beautiful children away from the family who so loves them. Keep posting and keep telling your feelings exactly as they are. Your honesty is amazing to me and is a great way of healing for you and your family. I am glad the foundation is getting ready to take off. Gabby will always be alive in the hearts of so many. Take Care and we all love you guys. Believe!!! John & Carolynn, as you know from my past post I have lost 3 children and have 1 living adult daughter. She was a child when I lost my other 3 children. We NEVER stopped talking about them. We laughed, we cried, we joked, and we smiled. Now many yrs later my daughter has 5 children of her own and her children talk about the 3 siblings their mom had quite often. Each home has a candle holder made to hold 3 tier candles and the base is in the shape of a heart. This candle holder was at my daughters wedding, is at all the holidays and any other special event. My point is sharing this with you again (but in a different way for a different reason) is to say – Gabby will NEVER be forgotten! She will live on through your 2 daughters and their children. She will live on through all the kind acts everyone does in honor of her life, through her foundation, and in so many other ways. i will write a longer comment this evening. i just want to say: gabby will never be forgotten. i think of her every day. and i think of you. you are always in my prayers.